You are here: Home / Types of Tea / Green Tea / Boston Tea Company’s Mint Chocolate Delight. Delightful, indeed. 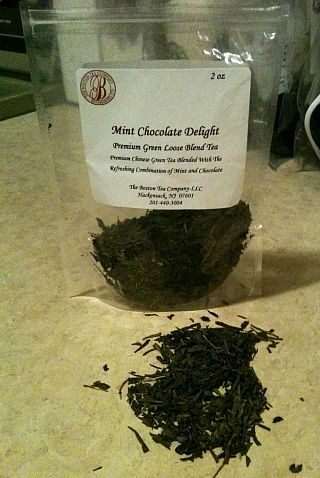 Boston Tea Company’s Mint Chocolate Delight. Delightful, indeed. The company recommends using one teaspoon of leaves for every 8 oz. of hot water, but I use a little more because the tea doesn’t steep very strongly, and one teaspoon is a little thin for me. The company also suggests adding milk or lemon as desired, but I kind of forbid you from doing that…messing up this tea with anything extra would be downright criminal. To purchase this tea for yourself or some other lucky person, visit Boston Tea Company’s official website here or follow them on Twitter here. You won’t be sorry. Enjoy!